This past fall, touring behind his sleek, jubilant debut album, Rachet, Las Vegas dance pop artist Shamir would occasionally play an unusual cover song: “Christmas Card”, a cut from Joyce Manor’s 2014 breakout album Never Hungover Again. The pick was surprising because, on paper, there are no similarities between Shamir’s disco revival and the pop punk clamor of Joyce Manor. But it worked nonetheless. In Shamir’s hands, the song went from a hurried, frantic burst of emotion to a subdued slow-burner still wrought with tension. Hearing the song in that context, it was clear that what makes Joyce Manor special is their command at writing simple, affecting pop. It’s this quality that has made vocal fans out of everyone from Mark Hoppus to The 1975’s Matt Healy, and this craft is what they push further through stylistic experimentation and risk-taking across Cody, their latest studio album. Joyce Manor shocked many longtime fans on Never Hungover Again by signing to Epitaph and polishing up the rough edges that were firmly on display in their earlier work. The Johnny Marr-esque guitars and glossy sheen pushed them firmly towards the “pop” end of the pop punk spectrum. While the leap from there to Cody isn’t quite as drastic, it is pronounced. Songs stretch to over four minutes — a positively Godspeed You! Black Emperor-level length by Joyce Manor standards — and the band alternates between ‘90s indie rock and mid ‘00s pop punk, opening up new directions for their sound. Thanks to the production of Rob Schnapf (who has previously worked with Guided By Voices and Elliot Smith), each foray sounds crisp, but it comes down to a matter of fit. The band sounds more comfortable on an Alex G-style stark melancholy ballads like “Do You Really Want To Get Better?” than the chunky power pop riffs of “Make Me Dumb”. While not quite an identity crisis, Cody is first and foremost a record of reflection and exploration. The three founding members (along with new drummer Jeff Enzor) are all turning 30 this year, and that impending milestone has them looking back. Besides the adventures on “Fake I.D.”, they delve into youth heavily on “Eighteen”, an early highlight about finding confidence as a teenager and understanding that your problems aren’t the end of the world. On “Stairs”, they tell a tale of frightening codependence disguised as overwhelming love over four minutes, on a song singer/songwriter Barry Johnson wrote when he was 19. The song’s age shows, as both in structure and content it sounds like something you might see on Fuse in between Cartel and All-American Rejects videos in 2006, slightly dated and immature but highly self-aware and catchy. Perhaps the fixation in the past comes from a sense of feeling disillusioned. Album standout “Angel In the Snow”, featuring subdued backing vocals from Nate Ruess, finds Johnson soberly asking “how come nothing amazes me, I don’t know.” It’s a surprising question from a band typically known for intense feelings, whether it’s of pain or bliss, and digs at the nuance Joyce Manor is often in tune with. A seemingly throwaway line on “Fake I.D.” references missing a dead friend, capturing how, even if you’re not actively grieving, memory can briefly pull you back. “Do You Really Want To Get Better?” finds Johnson nearly hopeless, wondering how to offer help to a friend going through addiction and only being met with rejection. “This Song Is A Mess But So Am I” may close the album on a wink, but the entire album is filled with loosely connected tangents in a stream of consciousness approach that plays to their strengths. Throughout Joyce Manor’s career, an arc shaped in one- to two-minute punk bursts, the band has displayed a knack for seamlessly cramming fully formed ideas and profound depth into as little as possible. “Fake I.D.” contains an aside in which the narrator tries to relate to a younger girl he likes by sarcastically overstating how much of a genius he thinks Kanye West is. It’s a pointed, humorous criticism as to the hyperbole many use to discuss today’s pop stars. It’s not even anti-Kanye, but rather an exploration of succumbing to a hive mind acceptance of something you don’t really believe in. It’s nuanced and fights reduction to clickbait, the kind of sharp analysis that the band can get across in two lines of a song. Because Joyce Manor pushed themselves out of their comfort zone in both format and style, it’s easy to forgive some of the missteps that pervade the second half of the album — especially when they are frequently punctured by moments of wisdom and cutting wit. The transitional record nails the discomfort of feeling out of place or unsure of yourself. 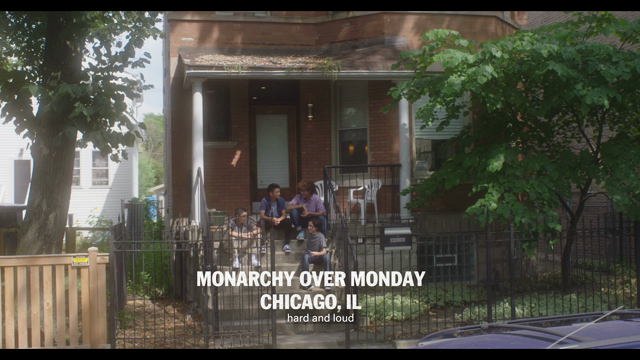 Imperfect but impassioned, Joyce Manor astutely capture uncertainty and anxiety throughout Cody.